The Smart Flow Transmitter Learning System (T5552-F1) adds to Amatrol’s Process Control training system (T5552) to measure the rate of differential pressure. It provides a 4-20 mA feedback signal that is proportional to the flow rate measured by transducers, differential pressure flow transmitters, common differential pressure flow sensors, and more. 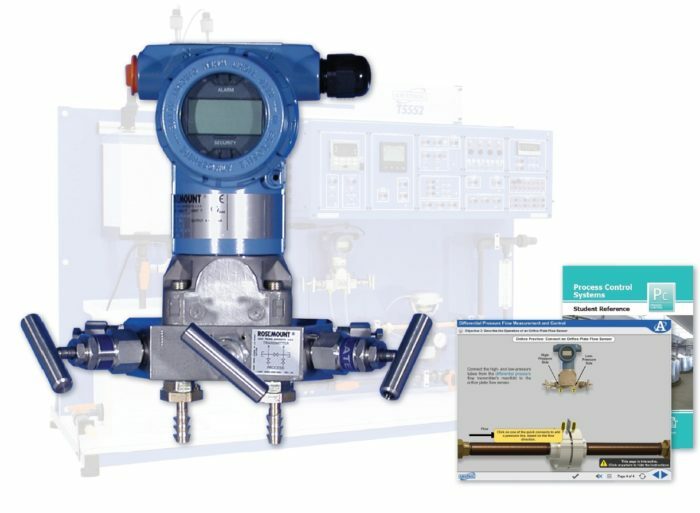 This Smart Flow Transmitter Learning System features interactive multimedia curriculum, a student reference guide, smart flow transmitter, and differential pressurization transmitter manifold. Learners can practice hands-on skills like measuring flow using an orifice plate flow sensor and a differential pressure flow transmitter, measuring flow using a pitot tube flow sensor and a differential pressure flow transmitter, and constructing and operating a flow control loop using a differential pressure sensor. Amatrol is committed to providing heavy-duty components for real-world development. The Smart Flow Transmitter Learning System includes an industrial quality transmitter and student learning materials to teach the learner hands-on skills. The transmitter mounts to the T5552 workstation and connects to one of 3 optional fl ow sensors: pitot tube, Venturi, and orifice plate. Some of the skills that learners will develop within the Smart Flow Transmitter Learning System’s curriculum include using differential pressure to measure flow, bleeding a manifold of a differential pressure flow transmitter, using a Venturi tube flow sensor and a differential pressure flow transmitter, and operating a closed loop flow and flow control loop using a differential pressure sensor. This Smart Flow Transmitter system includes Amatrol’s world-class curriculum, which combines strong theoretical knowledge and concepts with hands-on skills for the best industrial competency-building on the market. This thorough, exceptionally detailed curriculum is built to begin with the basics and steadily advance to more complex concepts and skills. This learning system’s interactive multimedia curriculum can be accessed anywhere, anytime with a computer and internet access. This on-the-go learning solution features all of the in-depth content that Amatrol is known for with the addition of stunning 3D graphics, videos, interactive quizzes and exercises, and voiceovers of all text. A sample copy of the Smart Flow Transmitter Student Reference Guide is also included with the system for your evaluation. Sourced from the system’s curriculum, the Student Reference Guide takes the entire series’ technical content contained in the learning objectives and combines them into one perfectly-bound book. Student Reference Guides supplement this course by providing a condensed, inexpensive reference tool that learners will find invaluable once they finish their training making it the perfect course takeaway.